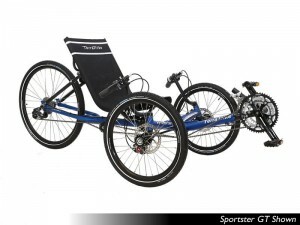 The undisputed Ferrari of our lineup is the culmination of 16 years of experience in trike design. If you are a trike enthusiast, you owe it to yourself to take a test ride on one of these. It accelerates faster, climbs better, and maintains high speeds easier than any trike we’ve ever ridden. And trust us, we’ve ridden them all. This is the super-car of trikes, and is a complete thrill to ride. With its no compromise approach to build quality, you can be confident you’re riding the best. The Sportster has a strong and light weight 6000 series aluminum frame that shaves valuable weight off of your ride. It comes stock with a 26″ rear wheel for higher gearing, and is available in four component levels to suit nearly any budget. If your goal is simply to move as fast as possible under your own power; then look no further than the Sportster! As if it couldn’t get any better; the Sportster is made in America and comes in your choice of four different colors – helping make this machine the most desired trike in our lineup.